My reviews can also be seen at: https://deesradreadsandreviews.wordpr...They were all there the day your sister went missing...Who is lying? Who is next?1996 - All thirteen-year-old Lenni wanted to do was walk to the store by herself to get an ice-cream. Her older sister, Claire thought it would be fine. Her parents were very overprotective. Lenni just wanted to have some of the freedom that Claire and her brother had. It was just a short walk ….what could possibly happen?Lenni never came back.2017 – It has been twenty years since Lenni went missing from the beach. Claire is now married and has two children of her own. No one has forgotten Lenni but Claire has carried around a tremendous amount of guilt for letting her sister out of her sight that day.Claire’s father, Patrick has been diagnosed with Alzheimer’s and it seems to be getting worse. Her mother feels that it is time to sell the family farm. Claire is upset…they’d made a promise….Someone must always be here….Claire decides that since they are selling the farm they should have one last get together…a reunion. Her friends always loved her father and she’s sure that seeing everyone will cheer him up. The whole gang will be there….including everyone who was at the beach the day Lenni disappeared.But as more and more strange things start happening...suddenly the reunion that is meant to be a happy occasion….turns into a nightmare.This story is told from many points of view and did take some time to get going. However, I was really intrigued by the characters and their individual stories. Sometimes with that many characters and side plots, I can find it hard to connect and/or keep everything straight. But I really didn’t have a problem in this case. With each perspective, we were given little hints. I started to question everyone’s intentions and whether or not that they could have had anything to do with what happened all those years before. Once I hit the halfway point, things really picked up and I was engrossed in everything that was happening. I had my suspicions and was eager to see if I was correct or way off base.“The Reunion” was a story full of secrets, lies, and deception. There was a lot going on, but I found it gripping. I became invested in many of these characters and couldn’t wait to see what was going to happen next.This was a clever and twisted tale with many excellent red-herrings. I thought everything came together fairly well, although there were one or two things I could have used a little more clarification on. But overall, this was a satisfying psychological thriller that I really enjoyed.I look forward to reading more from Samantha Hayes!Many thanks to Bookouture and NetGalley for providing an advanced copy in exchange for my honest review. Well... that was a wild ride! The Reunion by Samantha Hayes was truly an addicting read. I may have sneaked in reading this at a birthday party I had to go to! I definitely tend to read a little slower on weekends because of the kiddo but I was determined to finish! We get many perspectives in this story, which I’m a fan of but I know some of my bookish friends are not. So, what’s it about? Right from the prologue we learn that in 1996, Claire Lucas’ little sister has gone missing. Claire and her brother, Jason, were in charge of watching Lenni while they had a fun day at the beach. Lenni has not matured much since she was eight so, the parents, Shona & Patrick Lucas make a pact that someone will always watch for poor Lenni, the baby of the family. Flash forward to 2017 and Lenni is still missing. Shona and Patrick still live at the farm house never giving up hope of Lenni coming home. Claire also lives on the land right up the road. She’s married to Callum with two kids. Sadly, Patrick has been diagnosed with Alzheimer’s and he’s slowly but surely losing it. Patrick was almost a second dad to Claire and Jason’s friends growing up. She thinks it will do him good if she sets up a reunion of her childhood mates. She hopes it will bring back memories for Patrick. So, the gang all comes back to the farm house. We meet many characters and like I said we get their perspectives. Some you will like, some you won’t. You will be undecided on who to believe or what to think. In all honesty, I was unsure of this book until I read a certain perspective, then I was like omggggg. It was good y’all. As the reunion starts, sketchy things happen to Claire and she gets spooked. A LOT goes down in this book. Lies, drama, betrayal and possible triggers. (Message me if you want to be perpared) All In all I really liked it. I’ll give a solid 4. Thanks to netgalley and bookouture for a free ecopy for my review. I’m out. Drama, secrets, deception, twists, turns, and so many red herrings.“With a little bit of courage, with a little bit of help from someone in the right place at the right time, we can all escape.”It’s only towards the second part of the book that the story picks-up momentum and becomes a lot more engaging.The plot is Brilliantly-written. Some of the characters are likeable, others are utterly despicable.The story is told from different POVs, this usually works for me. However, in this book, I would’ve been fine with just Claire and Eleanor’s POVs.Sometimes the reasoning behind some characters’ actions is really hard to understand. I tried to decipher their thought process but failed, miserably.“Sometimes the only closure is accepting there will be none.”I hear you but still, it would’ve been nice to get some kind of closure when it came to you know who.All in all, this was a gripping read that I’d definitely recommend.I would like to thank the Publishers, NetGalley, and the Author for sending me an arc of this book.This review can also be found on my blog. The Reunion by Samantha Hayes was a excellent thriller that I did not want to put down. I really enjoyed the interaction of the characters and the twist and turns in the story. Claire's thirteen year old sister Eleanor goes missing while she is looking after her at the beach. All the family are devastated when she can't be found. Almost twenty years later Claire has a reunion with her family and closest friends at her family home. The reunion has consequences that rock Claire to the core and will change all their lives forever. I would like to thank NetGalley and Bookouture for my e-copy in exchange for an honest review. With 11-and-a-half months to go in 2018 as I write my review, it's too early to say this - but say it I will: If you have but one book to read this year, make it this one. Yep, it's that good. It grabbed my mind in the beginning and didn't let go till the end (and beyond - the next day as I finish my review I still feel like I've been run over with a Mack truck).The story begins in 1996, when a teenage girl named Claire is playing with friends and her little sister Eleanor ("Lenni") on the beach near the family's Trevellin Farm on coastal England. Striving to be independent, as young children do, Lenni begs Claire to let her go off on her own to buy an ice cream cone. Caught up in the thrill of the waves, Claire reluctantly hands her some money and warns her to hurry.But somewhere between there and back, Lenni disappears - and remains missing in 2017, when the here-and-now story kicks in. Claire still lives in a cottage on the farm near her parents, but now she's a successful realtor, married to a neurosurgeon and has two children. Her father, Patrick, has been diagnosed with Alzheimer's and is declining rapidly, forcing her mother to seriously consider selling the property (to which Patrick is vehemently opposed). In an effort to help boost his failing memory, Claire decides to host a reunion of the old gang of kids who used to play together. The group includes Claire's best friend Maggie, would-be restaurateur Nick and her brother, Jason, who's married to a very pregnant-with-twins wife.The idea is met with enthusiasm by all, except perhaps Claire's husband Callum, but take nothing at face value: All the guests are bringing baggage beyond the cases that carry their clothing. Maggie has made a career out of hopping from one boyfriend to another, turning her daughter, Rain, into the teenager from hell. Nick, who was Claire's first love, is struggling with serious family issues as well as his upcoming restaurant launch. Jason is looking forward to fatherhood, but not to seeing his own father - from whom he's been estranged for years. That issue, Claire hopes, will be resolved at the get-together.Interspersed throughout the book are chapters that show flashes of the past, each adding clues as to what the future may hold. But then, the unthinkable happens: Another girl goes missing. From that point on, there's never a dull moment (although in all honesty, I didn't notice any dull moments before she disappeared, either). The tension - and surprises - just keep mounting all the way to the jaw-dropping end. Whew!Now that I can breathe again, I guess all that's left is to highly recommend this book and thank the publisher for allowing me to read it in exchange for an honest review. Did I say whew? I try not to use "OMG" often, because then it becomes overused and doesn't have the same impact, however The Reunion deserves an OMG and perhaps even 2 - OMG, OMG!Samantha Hayes is BACK and this time she's signed with the brilliant Bookouture who are known for publishing top quality books by top quality authors. 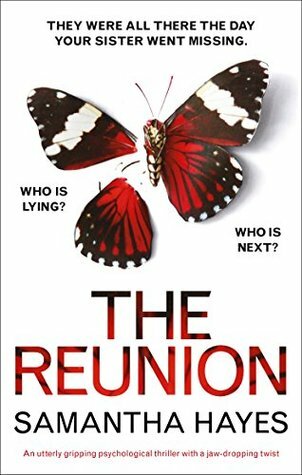 The Reunion is a brilliantly plotted, well written psychological thriller that kept me glued to the pages from the opening line to the last page.There was so much going on in this book that I don't even know where to start. Firstly the book alternates timelines and has several different narrators which I personally love. In 1996 13 year old Eleanor disappears whilst under the care of her older sister Claire and now 30 years later, Claire decides to host a reunion for those who were there. When another teenage girl disappears during the reunion in an almost identical scenario secrets, guilt and lies begin to unfurl.Once again Samantha Hayes had me hooked from the start and kept me guessing, double-guessing and doubting myself several times. I was convinced I knew who did what to whom, but changed my opinion about 10 times due to the amount of red-herrings and clever twists Ms Hayes is so good at. This is really a fabulous thriller and I highly recommend it. Oohh what a tangled web Hayes weaves in The Reunion! This was one of those books full of simmering tension and you just know things will boil over at some point, but waiting for that to happen is part torture and part delicious anticipation and all around addictive.There is quite a bit going on here, plenty of characters and all with some sort of mystery hanging in the shadows. It’s mainly focused on Claire, who’s sister Lenni vanished two decades ago while she was watching her. You also have friends and family who were connected in some way to Claire’s family back when Lenni went missing making it tricky to decide who to focus on. At various points I had my suspicions about every single character, I love that as it keeps me on my toes and the guessing and back and forth is always so fun.When all is revealed I had one of those moments where I realized just how clever Hayes is and how beautifully she had laid things out. The breadcrumbs were all carefully left but I never fully followed them, it really was put together in such a sharp way. The jaw dropping twist mentioned on the cover? It’s true, I actually gasped. If you love psychological thrillers and haven’t read a Hayes book what are you waiting for?! Snap this one up ASAP!The Reunion in three words: Intricate, Smart and Addictive. I started The Reunion 24 hours ago and have been hooked on it ever since, reading it at every available opportunity (thank you Amazon for the Kindle for iPhone app as when I didn’t have my Kindle with me I just needed to keep read this book). The Reunion is one of those books that never leaves your mind. Even when I wasn’t reading it, the story was constantly in my thoughts as were the characters as so many different scenarios of what might have happened ran through my mind. I am a huge fan of Samantha Hayes and I think The Reunion might be my favourite book of hers. She has written a story that is so real I became convinced I was reading about real characters. This book brought out genuine emotion in me as I read. I almost cried at one point because the emotion I felt was so strong. As the story neared its conclusion I couldn’t read quick enough nor take my eyes away from my Kindle. It’s a truly addictive story and I recommend reading it when you’ve got a day free because you won’t want to stop reading. The basic premise for the story (missing child aside) could be taken from a Women’s Fiction novel. Claire’s father Patrick is deteriorating with his Alzheimer’s and in an effort to help him out with his memories she invites her old friends and some family back to Cornwall for a reunion. Where the thriller aspect comes into play is years ago Claire’s sister disappeared when Claire reluctantly agreed to let her go off and buy some ice cream by herself. Once the guests arrive for the reunion the many different twists and red herrings that Samantha has filled this story with come into play and God is it good. Probably one of my most favourite psychological thrillers because of the strong characterisation, the sense of place is just fantastic and the story itself is just so addictive. We meet many different characters in this story and I wish that I could talk about them all. Samantha has written here a book that I think a book club would have no trouble discussing for hours on end. There’s so much that can be said. There’s characters you’ll love. Characters you’ll hate and characters you just won’t understand (such as why would Claire’s brother Jason keep quiet about a massive thing he discovers in her house? That just didn’t sit right with me at all and whilst it was probably for the purposes of the story it just annoyed me a little bit). The whole thing is so very believable in terms of the friendships. Meeting a friend you haven’t seen for many years can often bring out jealousy as you compare your lives with theirs but, if you are truly best friends, then all that can be overcome as you get to know one another again. There’s a lot of emotionally charged scenes contained within this book and whatever stage you are at in life, there will be somebody in this story that you can relate with. I felt that Samantha captured the teenagers especially well, the good and bad parts. In fact every single character was written well. I can’t find a major fault in this story that isn’t just a niggle that I had myself about a certain thing. But that’s why stories like this are so good, each reader will take something different from either the story or a certain character than I did personally. The Reunion would work brilliantly as a gripping drama on the TV. The pacing of the plot is incredibly strong, nothing ever drags and whilst it’s not a short read, I became so invested in these characters and the story that the whole thing just flew by and I will be thinking about this story and these characters for a long while yet. And I’ll be recommending the book to anybody who will listen. The tension in the story is brilliant, the intrigue is too. I don’t want to spoilt it too much but we follow one character and I almost built some kind of connection with this character. The chapters featuring them filled me with dread but also some kind of hope. It was uncomfortable at times just because of how real it all felt. This is a thriller that we could wake up tomorrow and read about on the news. If I had to say one thing it would be that a few things were left unanswered by the end of the story. For me this meant I found myself thinking about where I saw some of these characters ending up in the future. Some explanation is given towards certain things however I wanted more and I also wanted to see more justice for certain things. I had a few scenarios in my mind about what I thought happened to Eleanor and whilst what did happen was one of those thoughts, it still came as a big surprise to me, even more so when Samantha revealed more to us after that. Quite simply The Reunion is a gripping and believable story, one that I will not be forgetting in a hurry and if you only read one psychological thriller in 2018 then make sure it’s this one. Engrossing thriller - I read it over two days. In 1996 thirteen-year-old Lenni disappears after going for ice cream. Her older sister Claire had allowed her to walk to the ice cream shop by herself while she stayed at the beach with her friends. In 2017 Claire has a reunion of her friends to help her Dad remember things (he has Alzheimer's). There are a lot of interesting subplots going on at this reunion, as well as some things that happen that are reminiscent of when Lenni disappeared. What happens at this reunion week is fast-paced and will keep you reading. This is a well-written novel that will keep you reading to find out what's happening. Thanks to Samantha Hayes and Bookouture through Netgalley for an advance copy in exchange for an honest review. What a goosebumpy roller coaster ride of a book! A sister lost 20 years ago + a child lost now = a deja vu story. Samantha Hayes has done a fabulous job in writing a book which is gripping from the first page. Who is good? Who is bad? Who is lying? Who is telling the truth? What happened 20 years ago? What happened now? Why did the girls disappear? The only factor that was common to the two girls disappearing were the characters. Mom Shona and dad Patrick, children Claire, Jason, Lenni, friends Maggie and Nick. And there are enough lies and secrets circulating amongst them all, including the spouses and children. The reunion which was organised to help their father Patrick's memories get a boost-up, as he was diagnosed with Alzheimers', but it turned out to be a re-hash of a missing girl. Samantha has maintained the tension throughout the story, drawing the reader to keep guessing about the perpetrator. The story starts slightly slow, allowing the characters to develop, making the readers complaint, the adrenaline slowing dripping into their blood stream. And then it suddenly picks up pace for the grand finale, the answers rushing up to the reader faster and faster, making the atmosphere breathless, till it feels too rushed in time and space, and some parts were left unanswered, though they were not the most important bits. A good mystery, entertaining in its unfolding, percolating in the middle, and dramatic in its ending. A reunion held for keeping the memories afar turned out to be a reunion of skeletons jumping out from the closets. I received an ARC from NetGalley and publisher Bookouture, and this is my honest and unbiased opinion. Ooh what a dark and compelling read this is.I liked Claire from the off. She is a wife and mother who is trying to keep everything together. She has never gotten over her sister disappearing or the guilt that came with it. When her dad is diagnosed with Alzheimer’s, she throws herself into getting everyone back together.There are so many likeable characters in the story. From Maggie, Claire’s childhood best friend and Nick, the love interest when Claire was younger. They all have a bit of a history of their own and I enjoyed finding out more about them the further into the story I got. As so many of them were likeable. I couldn’t imagine how any of them could be connected with the disappearances.The Reunion is an unputdownable and gripping read. I pretty much read it in one go as I was desperate to find out how it would end and what had really happened to Eleanor. It certainly had me feeling some very mixed emotions that I wasn’t expecting. A definite must read for fans of this genre. 4.5⭐️The year is 1996 and after much begging, Claire, who was given the responsibility of looking after her younger sister, Lenni, allows her to go buy ice cream on her own. LENNI NEVER CAME BACK! The story then takes us to present day, where Lenni is still missing and Claire's father, Patrick, is suffering with Altzheimers disease. She decides it would be helpful for her father to set up a reunion of her childhood friends, as Patrick was much like a second father to them. These were the same friends who were around during the time Lenni disappeared.From here on out the reader is exposed to the POV of various characters.The build up of this story started off slowly as we get introduced to the situation and the group of characters, some likeable, others...not so much! But trust me, you'll want to keep at it, as the reader will soon discover that another girl goes missing, strange things start happening to Claire and it becomes clear that secrets and lies are plentiful. With this, the pace and tension suddenly turns up several notches, morphing the story into a page turner you won't be able to put down with twist after twist, until the final jaw dropping one leaves the reader breathless, gobsmacked and well pleased with themselves that they picked up this fantastic read. If you're into gripping psychological thrillers, filled with secrets, lies and betrayal, being entertained with twists, red herrings and an ending you won't see coming, I suggest you grab yourself a copy of this one ASAP.Many thanks to Netgalley, Bookouture as well as the author for my copy of this great read in exchange for my honest and unbiased opinion. I am a HUGE, and embarrassingly loud, supporter of Samantha Hayes as it was this brilliant author who ignited my passion for psychological thrillers when I read her debut novel whilst on holiday a few years ago. So I was over the moon when she signed to Bookouture and as soon as The Reunion was up on Amazon I was pressing that pre-order button! And OMG I am so glad that I did! This is one of her best books so far, full of shocking twists with a plot full of red herrings and untrustworthy characters. I gasped out loud in horror at several points throughout the narrative as Samantha Hayes weaved her wicked web of deception and I bloody well loved every single minute of my time reading The Reunion.I truly felt the emotions flow off the page as I delved deeper into this storyline about the people left behind to cope with the disappearance of Lenni. Her sister Claire has never forgiven herself for letting her sweet natured and “unprepared for the real world” sister out of her sight that day. Many years have now passed and she is happily married with children of her own but she is still shocked when her parents decide to sell the family home. With her father’s Alzheimer’s, it is just too much for her mother Shona to cope with. But before they sell, Claire decides to arrange a reunion of her friends and family to help Pat relive some wonderful old memories before it’s too late. All the guests were also there THAT day but does one of them know more about what happened to Lenni than they are letting on?This book messed around with my emotions continually throughout, never quite going in the direction I was expecting, giving me a little hint but then snatching it away again till I was practically exploding with the need to know what had happened to Lenni and why. And when we eventually got to that final shocking denouement, I wanted to turn right round and read the whole book again from page one!! It was so perfectly set up to blow me away with its surprising revelations that I got goosebumps as I read the final few pages. And I’m getting them again now just thinking about it!This is a gripping and involving book and I especially enjoyed how the split timelines worked together with one of them working backwards in the first person until the storylines entwined. If you want a well written, engrossing page turner that will keep you guessing till the very end then you need to read The Reunion!Highly recommended by me! The Reunion is a realistic thriller that explores the devastating effects of secrets and lies while playing on a parent’s worst fears. Sometimes a little white lie isn’t so little, and sometimes people do the wrong things for the right reasons.Summary:In 1996, Eleanor, a.k.a. Lenni, is given some money for ice cream by her older sister, Claire, and told to hurry back. But Lenni’s not supposed to be going off on her own because she’s “different” than other kids. She’s a little slower. Lenni never returns, and all that’s found of her are a pair of shorts and an ice cream cone.By 2017, Lenni’s disappearance has become a cold case, and life has moved on for the Lucas family, for the most part. Lenni’s room is still the same, and the family still lives on Trevellin Farm—for now. After all, they’d made a promise that someone would always be there, just in case Lenni found her way home, and even after so many years, not everyone’s ready to give up hope. But Patrick’s suffering from the early stages of dementia, and Shona is finding it hard to manage both her husband’s deteriorating health and the farm, despite Claire and her husband, Callum, living next door. So she’s determined to sell Trevellin Farm once and for all.In a last ditch effort to improve her father’s memory and possibly convince her mother to change her mind, Claire organizes a reunion. She invites her brother, Jason; her childhood best friend, Maggie; and her former crush, Nick, all of whom regarded Patrick like a father. All of whom were also there the day Lenni went missing. What was meant to be a fun time quickly goes downhill as everything from the past is dredged up again and new secrets emerge.Then, another girl goes missing, and the similarities are too obvious to deny. If they find her, they might just discover the truth behind Lenni’s disappearance all those years ago. But they have to hurry; time’s running out.The Good:- That cover, though. I know, I know, you’re not supposed to judge a book by it’s cover. Well, I happen to be a judgmental person (aren’t we all?). So sue me. I’ll be honest, though, the reason I looked at this book in the first place is because the cover caught my eye. The simplicity of it is interesting and further highlights the pop of the butterfly, which is a very bright red—danger, warning, death, blood? All of the above? Not only that, but the butterfly is disintegrating. One side is strong, healthy, and normal, while the other is falling apart, which is a visual that I love (and which, having read this, perfectly sums up the plot).- Lenni’s alive! I can say this without it being a spoiler, because guess what? Surprise! She’s a point-of-view character. Actually, I thought this was quite masterfully done. Lenni’s point of view is woven between present-day chapters. There are glimpses of the life that she’s been living, the sort of place she’s in, and how she’s treated. It shows that she’s got a personality (a fantastic one, actually) and isn’t always complacent, but it does show what a toll it’s taken on her. I thought this was actually unique, and it definitely builds the suspense, as I was trying to piece together where she was and who her captor was.- The secrets! Oh, the delicious secrets. I mean, everyone has to have at least one, right? But secrets have the ability to shatter lives, especially in this book. Some of them are quite upfront, like the fact that Rain’s father is a big-wig politician who cheated on his wife with Maggie and doesn’t want the world to know about his illegitimate daughter. Most are not, though, and while Hayes hints quite often that something’s there, it’s a slow build up, which I thought created a marvelous amount of suspense.- THAT ENDING. Fdjiafjdla. Okay, so, it’s subtle. Which I love. Hayes doesn’t just come out and say who the “villain” is. In fact, there are a lot of villains to varying degrees and in a lot of different ways, and for the most part, the villains themselves had motives for their actions (whether they were good motives or not, I’ll leave you to decide). Instead of just blurting out what happens, Hayes makes you work for it. I know, work is hard, but it’s worth it. The subtlety was beautiful and made a lasting impression in my mind.- I DID NOT SEE THAT COMING. Actually, I don’t know if this is a good or bad thing. As it made perfect sense and was a fantastic way to wrap up the book, I’m going to include it in the good. Some might say it’s bad because there weren’t more obvious signs, but like I already said, you gotta work for it, man! I pieced together who did it before it was revealed, but not far before, so the clues were there. It wasn’t like a velociraptor jumping out of an alleyway at night sort of surprise. But it was a surprise, nonetheless, one that pulled me in so many different ways emotionally, and I consider that pretty darn good storytelling.The Bad:- Some of the characters were unbearable. Well, namely, Callum and Rain. I hated them both from the start and just wanted to yell. Gah, they were so annoying. I understand what they were going for with Rain’s character. Broken family, troubled girl starving for attention, acting out, yadda yadda, but it went too far, to the point where I couldn’t sympathize with her. Yes, I understand that perspective, but you, ma’am, are just a jerkface. Also, I’m still not sure why anyone would put up with Callum, let alone marry him.- It starts off really slowly. Well, if you discount the immediate kidnapping, of course. There’s a nice hook provided by that glimpse of the past, but other than that, it takes a while to build the mystery. It’s worth hanging in there, but there are some slow scenes to start off with.- Jumping points of view. You know what? I’m seeing this a lot lately in books, but I’m going to count it as a negative here. Not all the jumps are bad. As I said before, I loved the chapters from Lenni’s point of view. Unfortunately, as I said before, there were characters I couldn’t stand, and it’s really hard to read anything from their point of view without feeling like I should throw the Kindle. But, you know, it was expensive. Actually, I almost feel that most of the non-Claire and Lenni point of views were unnecessary. I don’t think it would have lost anything if this had been just purely Claire and Lenni’s story, which is why this earned a spot in my negatives. I mean, there is one major red herring that would be lost, but you know what? It was too obvious for me to consider, even for a second, which means it’s really no loss at all.- I didn’t understand the character’s motives. If this had happened once, I could have brushed it off, but it happened multiple times, where someone makes a big decision to lie. Not a little lie, but a massive one, for reasons that I don’t get. In really shady situations, for basically no reason, and even their thought process (because remember, everyone’s a point of view character) makes no sense at all. I mean, even if you’re my best friend, I’m not covering a felony for you. Especially an obvious felony that I have proof of. The book is a whole series of questionable character decisions that I just didn’t at all understand, which was frustrating at times.- A couple of loose ends. I feel like I say this a lot. In fact, I probably do. If you’re writing a series, I expect loose ends, but in a standalone? Especially a mystery? Loose ends drive me a little wonky. As these constitute spoilers, I won’t elaborate. However, there’s a major “mystery” that’s alluded to in Nick’s character arc, and since there was such a big deal made about it, I expected there to be a conclusion at some point, but there wasn’t. Now I’m not really sure what to think. Was I right to be suspicious of this “accident,” or am I just reading too much into it? It’s driving me crazy! Also, there is no closure regarding one of the characters. He just poofs. Which is a fairly big deal because of his role in the novel, so I felt a bit cheated that there was no real resolution with that.Overall:I’m going to give it a solid three stars. While it starts off slow, once the mystery ramps up, it kept me turning pages eagerly. The mystery is wound nicely throughout the book—obvious enough where it makes sense by the end, but with enough twists to keep me guessing. Several scenes really tugged at my heartstrings, and I was so confused because I was also angry and sympathetic and OMG, WHY? In a good way, of course. It’s definitely a slow burn mystery/thriller, but worth the read. My biggest problem was with the characters. I found myself questioning their behavior far too often, which pulled me out of the actual story and annoyed me more than anything. A lot of it was also just me not liking or being able to connect with the characters, which is a pretty personal thing and one that not all readers will have a problem with.Disclaimer: I received a free ARC copy of this from NetGalley in exchange for an honest review. "She was like a butterfly trapped in a jar. "This was a carefully told story, the gears slowing turning while each part of the story works it's way in to place. The way Samantha Hayes has written this novel entices the reader to keep going. Chapter after chapter... there's a desire... a NEED to piece it all together. We MUST know what has happened to Eleanor and who's to blame. Eleanor, at the age of thirteen, wants nothing more than to be free, to be independent like her older siblings, Jason and Claire. After all, she's thirteen, she's not a baby. Only Eleanor is not like everyone else, Eleanor suffers from an undiagnosed condition, she's not like other kids her age. Though she may be thirteen, and by all accounts a teenager, her mind is still a child. Still, when Eleanor wants nothing more than to go get an ice cream by herself on a warm sunny day at the beach, her older sister, Claire, eventually gives in and insists that she come right back and that she stick to the beach where she can be seen and to not take the short cut. Claire and Jason often felt sorry for Eleanor, she was never free to do anything on her own. Her parents were constantly smothering her and if they weren't present then her and Jason were always expected to watch her. Only, on this day, Claire had other things on her mind... or rather someone in particular. She had waited all summer to kiss Nick, could this be her chance? Claire will never forgive herself for her decisions that day. Eleanor never came back. Police found her ice cream, shorts, and the small pendant she kept in her pocket that was given to her and Claire by their father. Decades have passed and they are still no closer to finding answers as to what happened to Eleanor that day. Is she dead, is she still out there somewhere, is she safe? Though the Lucas family has moved on, they have never forgotten, and they have made a promise. They have made a promise to remain on the farm in case one day Eleanor (Lenni) comes home to them. So when Claire's mother, Shona, decides she wants to sell the farm, this comes as a surprise to everyone. Patrick, Claire's father has recently been diagnosed with Alzheimer's and the early stages of dementia have set in. This has become too much for Shona to manage along with caring for the farm and B&B. Her mind is made up, it's time to sell. Patrick, in his current state is not so inclined to agree. Claire decides that a reunion of all her old friends from childhood might just be what her father needs to help him through this difficult time. To help him to prepare for the move; a way to brighten his spirits and help him remember the good times. Only what Claire doesn't realize is that this reunion brings more pain and despair than any of them could have imagined. This will be the most difficult reunion of all. This was an intriguing psychological thriller. As you begin to understand the motives behind each decision that is made you begin to connect to these characters more and more. Though there is one thing that I was somewhat bothered by; the author made an attempt to put one of the characters in line as a possible suspect in the disappearance of Eleanor, and even Rain. This didn't work for me because it was a failed attempt in my opinion. This character is actually the last person to see Rain before her supposed disappearance, though they are never questioned by the police, and this person never volunteers information about seeing Rain at the beach. I found this as a flaw in the storyline. In the end though, I did enjoy this novel. It's very well written, and it's characters are well developed. It's not a story with a happy ending in my opinion, it's what I would call bittersweet. I want to thank NetGalley, Bookouture, and Samantha Hayes for allowing me the opportunity to read this novel in exchange for my review. Twenty years ago, August 1996, 13-year-old Lenni Lucas disappears while walking to get ice cream. Claire Lucas, now Rodway, older sister to Lenni, was 18 years old at the time. She and her friends were splashing about in the water of Trevellin Bay, a normal day at the beach. When Lenni did not return, the Lucas family, their friends, relatives and the police searched and did all the normal things that people do when a child goes missing. To no avail. The only signs were a dropped ice cream cone and a pair of shorts. Lenni was gone.The family somehow puts itself back together over the next 20 years without the baby of the family. Patrick, the patriarch, is a well-loved husband and father to the Lucas kids as well as to their childhood friends. Shona, mom to all, handles everything -- especially now that Patrick has been diagnosed with Alzheimer's. Claire and her brother Jason get on with their lives, marry, have their own families -- but still have so many questions. "In the end, our suffering came from not having anyone to blame, from not knowing what happened. "Claire decides that it would be a good time to get some of the old crowd together to help her dad with his memory issues. She has two children (Marcus and Amy) and her best friend from back then, Maggie, has a 15-year-old daughter, Rain. Old flame Nick -- Claire often wonders what might have happened between them had Lenni not vanished. Sets it all up for lots of potential drama considering that Claire has a son about Rain's age. All the relationships are complicated. The big impetus, however, is that Shona wants to sell the old farm because she can't take care of it and her husband too. So, a last little reunion to celebrate and reminisce. Things don't quite go as planned.Wow, there's a LOT going on in this book. Many different characters and narrations from different points of view. It's hard to imagine all this happening to a single group of people in a small little town, but all the big themes are there. Deceit, betrayal, heartbreak. Not a single character in the book has an easy time of things. It was almost too much, if you know what I mean. I won't say more to prevent spoilers, but despite all the red herrings that the author uses to obfuscate, some things were obvious quickly but one took a little longer to become clear. I am sorry to say that I really didn't like any of the characters in the book very much. Couldn't relate to them. But it was a good family drama story. I am not sure I would call this a "thriller" but more a mystery. I didn't find it suspenseful or heartpounding, etc., but definitely the word I'd use is DRAMA. I did have a hard time putting it down as I wanted to see what was going to happen to this poor messed up group of people next! The ending came a bit abruptly and a few dangling ends were left to my imagination.Thank you to NetGalley and Bookouture for this e-book ARC to read and review. I think most people will be fascinated by the train wreck that is the Lucas family! Enjoy! What a little cracker The Reunion turned out to be, when I first started reading this book I admit I had some reservations, there seems to be an abundance of children going missing crime/psychological thrillers on the market at the moment, and the pessimist in me wasn’t convinced that author Samantha Hayes would be able to put an original spin on a well used subject, but somehow she does.The book begins with the disappearance of teenager Eleanor, whilst spending the day at the beach with her brother, sister and their friends. Fast forward twenty one years and her family are still no closer to knowing what happened to her all those years ago. Dad, Patrick is now suffering from Alzheimers, and daughter Claire decides that a reunion of friends and family could help her dad with his memory issues. As the group of friends are reunited they find themselves plunged into a further nightmare as shocking secrets are slowly revealed.If I’m honest I thought the first half of the book was very slow, the time is spent introducing the reader to the array of characters and building on the mystery and suspense surrounding Eleanor’s disappearance. I can’t say I was a fan of any of the characters, some of them appeared shallow, others were just downright unlikable, and I did find myself questioning their behaviour and some of the choices they made at times, the only character I could summon up any sympathy for was Eleanor, but that said it did not stop me enjoying this book. The author manages to ramp up the tension by creating characters that are almost impossible to trust.The Reunion has some great twists and red herrings to make this an intense and a heart pounding read, yes I pretty much guessed one of the major twist early on in the book, but I would never have guessed the motive or some of the other devious sub plots, and I did have a couple of “OMG” moments towards the end where the author surprised me which always enhances my enjoyment of a book. If I had to say one thing it would be that a few things were left unanswered by the time I reached the end of The Reunion but never the less it still made for an intriguing read. Woah !! I did not see that coming !! I am sad, disappointed and pissed off at the end of this book.. (this is a compliment of course !) This one particular character was always annoying, and now I am just plain angry.. So, the book begins on a thrilling note. Claire's younger sister is missing and it happened on her watch. The police are investigating but so far they have found no trace of Eleanor. Claire's family is devastated and heartbroken, since Lennie is also a special needs child.The only thing that was found were her bloodied shorts.Moving on to the current situation, things get a little slow now, introducing us to present-day Claire, her husband Callum, their children Marcus and Amy. Claire still lives close by to her parent's house and often checks in on them. Her father has been diagnosed with Alzheimer's and seems to be forgetting everything. All of Claire's friends, who were present when her sister had disappeared have moved on in their lives. Claire plans a reunion party for the sake of her father hoping that having everyone back might trigger her father's memories. So we have Nick (Claire's then crush, but it seems they still have unresolved feelings) who is divorced, Maggie who's had an affair with a married politician and has a troubled teenage daughter and Jason, Claire's enstranged brother who considers himself of no use and his pregnant wife Greta who earns the money for them. Add Claire's complicated family to this complicated friendship, we have what is called a "mess". Maggie's teenage daughter Rain is annoying most times, thinking she can sway all the men and boys alike. But this girl has serious issues which her mother has absolutely no clue about !! Callum doesn't like Nick and Claire's growing closeness.. Claire is getting blank calls, strange and freaky things are happening to Claire.. and it all seems to be linked with her sister's disappearance all those years ago..And if this is not enough, Maggie's daughter Rain also disappears in an eerily same manner.. same clues.. same signs.. Is it history repeating itself ? Same perpetrator ?? Same MO ? ?One particular character seems to be hidden in plain sight.. this character has secrets that can blow your mind ! I was shocked at the end and I didn’t know what to make of it. I am pissed.. It doesn’t feel fair or even just.. Will noone ever know what triggered the entire plot ?? And I am also feeling sad.. I mean, the person who thought that the only way to protect Eleanor from the outside world was to keep her locked.. was wrong.. maybe a little mentally unstable, but were the intentions good ?? I am not sure.. there is so much grey in this character.. will that person be always misjudged ? ?Will no one ever know the truth ?? Will the truth lighten the betrayal ? This book left me unsettled !Thank you NetGalley and Bookouture for this ARC !This review can be also found at moodycrabsite.wordpress.com/2018/02/1... along with other reviews. A completely engrossing thriller that kept me on tenterhooks throughout!When teenager Eleanor disappears, her family spend years praying for her return, but decades down the line, they are still no nearer to knowing what happened to her all those years ago. Dad, Patrick is now suffering from Alzheimers, and daughter Claire decides that a reunion of friends and family who were there the day Eleanor disappeared could help her dad with his memory issues. But then another young girl disappears and the group is plunged into a further nightmare as shocking secrets are slowly revealed.Full of suspense and a host of possible suspects, my mind wandered down all sorts of avenues trying to work out who the culprit was here, and I was literally racing towards the finish as I just had to know! The finale certainly didn't disappoint as it wasn't the one I'd been predicting. Although some of the characters turned out to be less than savoury, they were all incredibly well described and Samantha's writing elicited empathy for some and pure loathing for others. A well thought out and highly creepy plot made this a terrific read, perfect if you enjoy psychological suspense. *I received a copy of the book from the publisher via NetGalley in exchange for an honest review. As soon as I heard Samantha Hayes had a new book out I jumped up and down and said 'yes please' to the blog tour. I didn't know the title, nor had I read the blurb - that is how much I love this author. The first book I read by Samantha Hayes was 'Until You're Mine' and I was absolutely blown away. I have devoured each of her subsequent books and find them totally captivating and engaging. Each one an intricate tale that has you guessing right until the final pages.My expectations for The Reunion were high and Samantha Hayes met them and some. The Reunion is centred around a group of friends and family brought together by Claire to try and bring back happy memories for her dad who is now suffering from Alzheimers. They are friends that spent more of their weekends and holidays at her parents farm than they did at their own homes. With her mum and dad acting as surrogate parents to them all, that was, until the day they were all at the beach and Leni (Eleanor), Claires sister went to the shops for ice-cream and never came back.This is a thriller that has a devastating, sad story that appears to be mirrored over twenty yers later. Deliberately or a coincidence? That was one of my first questions as I submerged myself in the plot. The story is told from several perspectives and from both the past and the present. The Reunion is woven with several plot twists and sub plots that originally seem separate with no connections, they had me guessing at possible solutions only to find I was wrong each time. Samantha has intricately stitched up this story like a patchwork quilt - all of the pieces once put together make for a gut wrenching, heart pounding emotional read. There were so many times I thought I had it all wrapped up only to find I was way off the mark. and when the answers come with the end of the book I sat back open mouthed - words failed me. This is a book that has an unthinkable storyline running through the heart of it. Yet, I promise you'll be as hooked as I was, it that will make you sit back and be thankful it was just a book, it's not real - yet it so easily could be!In case you haven't guessed, I absolutely loved this book and highly recommend it - it's a psychological thriller with a plot that is so intricacy woven it will leave you guessing right until the end. I sat open mouthed, just quietly thinking when I finished and i still have questions a week later - WHY? I so need to re-read this again!! Thanks to Netgalley and Bookouture for my copy.Claire organizes a reunion of her old school friend to help her father who has been diagnosed with Alzheimers. Her parents are struggling to maintain their farm and her mother wants to sell it. Unfortunately this is the home that her 13 year old daughter lived when she disappeared 20 years ago.There is a whole cast of characters here and several of them are unlikeable and downright horrible. Claire's husband Callum is a total jerk and thoroughly contemptible.Maggie, Claire's best friend. Ugh this women just needed a good shaking. She is selfish and negligent as a mother. Her daughter Rain is a precocious entitled spoiled brat. The author does a great job in balancing these characters though as I still cared about what happened especially to the two females. For me as a reader I want characters that I dislike but am still moved by them emotionally. Apart from Callum that is, I really didn't give a damn what happened to the entitled prig.There are some red herrings along the way and the ending was good but I still felt there were questions unanswered. Overall though a very enjoyable and interesting read. What a brilliant suspense filled psychological thriller with lots of twists and turns. The story line is amazing, I don't know how the author came up with the idea but I'm glad she did. I read it in two sittings, The ending left me gobsmacked coming as a complete shock, it was hard to put down and highly recommended. Claire decides to bring her childhood friends together for a week, hoping that the reunion will help her Alzheimer-affected father remember the good days. But then, a young girl disappears and the similarities to the disappearance of Claire’s younger sister, Eleanor, nearly two decades ago, are too striking to ignore. The Reunion started off with great promise, had a solid middle, and lost its way at the end. It was easy to figure out who was responsible, given that it had to be one of the main characters. But still, I hoped there was a good enough reason for his actions that would be revealed at the end. Try as I did, I could not wrap my mind around the reasoning for why a sane person did what he did. The ending didn’t work for me. *Received an ARC from NetGalley in exchange for an honest review.